This week our discussion will revolve around the theme of prayer. This discussion guide is meant to complement your daily study of the Sabbath School Bible Study Guide. There are quite a few people who turned to prayer in the Bible. 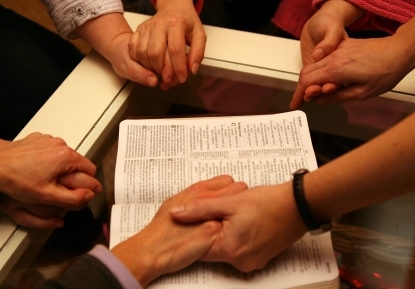 As a group, make a list of Biblical stories about people who prayed. Who was the person? What was their station in life? What were the key elements of their prayer? Explore the stories in the Bible. Now do the same exercise with your own life. What key prayer or prayers, which you have said, stand out at the highs or lows in your life. What was your station when you said that prayer? What were the key elements of your prayer? What was the result? Which of the stories you just heard from each other stands out a special to you? Why? Compare our stories to the stories told in the Bible. What do you notice? The stories we just shared from the lives of people of faith, be they in the Bible or here among us this morning, are examples of the power of prayer. When God’s people pray, sometimes miracles happen. Other times when God’s people pray it seems like nothing happens for a very long time. But one thing is certain. One thing has been proven repeatedly by every story this morning. God’s people pray. Let’s spend time in prayer now. What can we pray for? What are your joys? What are your cares? What are your desires? What are your hopes? Spend the remainder of your group time in prayer. Break into groups of three or more. Stay together as a large group, if you wish. Focus your prayers on the messages from God that emerged in the stories told during Sabbath School and on the requests made by group members. You may wish to commit to a regular prayer time, as a group. There is amazing power in praying together. Why let it end?